An image from Suicide Squad, whose members may be in one of two movies filming this year. Image: Warner Bros.
For the past few weeks fans have been wondering what’s happening with the DC film universe. Now we have a better idea. Each of those films have writers attached and are in the process of getting their scripts right. Some also have directors, too. None are ready to move forward just yet, though, and Kroll says if it doesn’t work out and only Aquaman shoots this year, the company is okay with that. Matt Reeves’ Batman solo film will be shooting next year with an eye on a 2019 release. 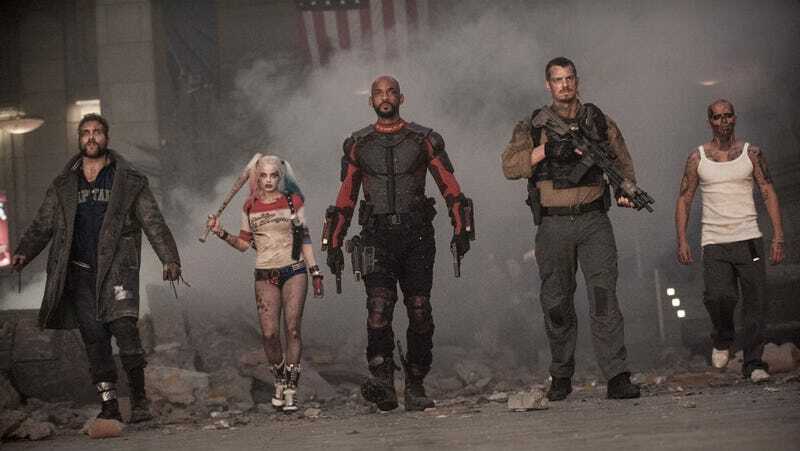 As detailed in the below article, there are 17 DC movies in various stages of development and these five are certainly near the top of the list. As we discussed earlier, The Flash has been in development the longest, with the lead role already cast and two directors having joined, then left, the project. At one point, it was actually supposed to be released one year from today. Despite all the setbacks, it still seems the most likely film to be ready next. On the other hand, Suicide Squad 2 just got a writer this week. I’d put that in the last position. As for the other three, they’ve all had attachments for at least a few weeks. If one writer has a better idea than another and the script comes together faster, anything could happen. This has been your DC Films update.